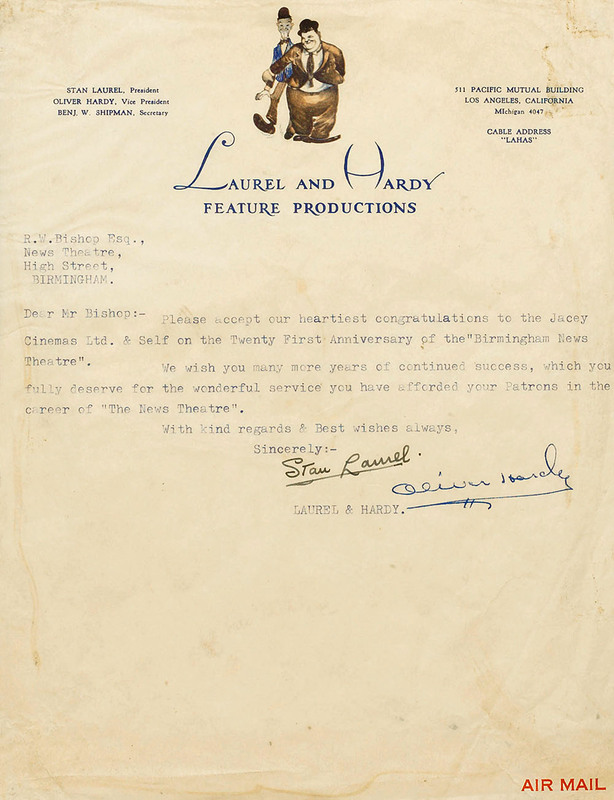 Please accept our heartfelt congratulations to the Jacey Cinema Ltd. & Self on the Twenty First Anniversary of the Birmingham News Theatre. We wish you many more years of continued success, which you fully deserve for the wonderful service you have afforded your Patrons in the career of "The News Theatre". Sorry, I didn't receive your letter of the 13th until the 15th, so was unable to let you know that we would have been pleased to have had you visit us back stage. However, we hope you enjoyed the show. With regards & best wishes to yourself, Dad, Mother & Sister. Thanks for your enquiry. I was born in Ulverston Lancs. but spent several years in North Shields - due to my Dad having several Theatres in the Tyneside section, I also spent a few years in Glasgow Scotland. Don't be too hard with your colleague, as I am partly claimed in both latter places. If you will kindly send me your Son's name - I shall be pleased to send him an autographed picture of L&H. By all means come back stage & see us Tuesday tween shows - we shall be delighted to meet your Mother & Self. All news when we see you. Sorry we couldn't get to see you - but hope you will soom be well again. Just recd. yours of 16th inst. Glad to note you have moved into a flat - am sure you will be much happier there & more comfort for you, being able to sit down to your own Breakfast etc. Too bad you didn't do that long ago. Do hope you will land something with Rudy Maté - a very good friend of mine - He was camera man on a Picture with us. Saw him in Paris when we were there last year. A swell guy - Give him our love if you see him. Have you seen Lois & Rand? Got a letter from her also today - She has a new English Austin Car - a little A.90 Atlantis - They are crazy about it or with it! Pleased you are not going to wait too long in Hollywood Booth - as I've told you - its fatal, & knocks down your morale in no time - when are they going to release the "Big Sky"? maybe they are waiting for TV to fold up. Note re 1111 Franklin - am surprised - as one or two people wrote & said how nice it looked - anyway am not worried about it - as it has to be done over when I get back. We may do Panto here at the London Palladium, Xmas - Ben Shipman is coming over to look into the deal - will let you know if anything happens. All here as usual - looking forward to Dublin - leave Hollyhead - Sunday night - arrive Monday a.m. but don’t open till Tuesday - due to not being able to scenery & props in time for Monday show - so will have a chance to look around a bit. Will drop you a line from there in Gaelic. All for now Booth - Trust something has happened for you by now. Eda joins in love & kind thoughts. Polish-born Rudolph Maté (1898-1964) was one of the most respected cinematographers in the industry. He worked with Stan and Ollie on Our Realtions (1936). The Austin A90 Atlantic is a British car that was produced by the Austin Motor Company from 1949 to 1952.